Analysis: The two parties were close to a deal Monday, and the terms have officially been worked out. Bellamy made just 14 catches through 16 games with the Bears last season, and he'll have tough competition to exceed those number in 2019, especially after pass-catching back Le'Veon Bell signed with the Jets. Analysis: Bellamy saw limited work as the fourth receiver in Chicago in 2018, catching 14 of 25 targets for 117 yards and a touchdown. Perhaps the most value that the 29-year-old possesses is on special teams, as he played 274 snaps in that category last season. Bellamy likely won't provide any fantasy value in most formats, even with the switch in teams. Bellamy caught one pass for two yards in the Bears' win over the Vikings on Sunday, and finished the season with 14 receptions for 117 yards and a touchdown. Analysis: Aside from seeing work on special teams, Bellamy emerged as the Bears' fourth receiver, although that certainly wasn't a high-volume position. He's now an unrestricted free agent who will likely function in a similar role wherever he ends up signing. Bellamy caught one pass for 18 yards in the Bears' Week 15 victory over the Packers. 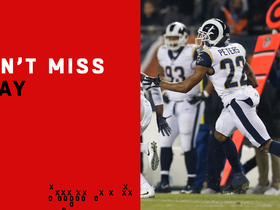 Analysis: Due to his small role in the offense, in which he's caught a total of five passes over his last seven games, he won't be a recommended lineup option in the fantasy playoffs. Bellamy was not targeted during Monday's 15-6 win over the Rams. Analysis: Bellamy has now failed to garner a target in three of his last six games. 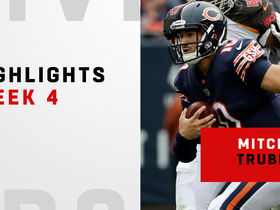 Chicago's passing attack has been inconsistent overall in that span with two solid performances by backup Chase Daniel sandwiched between starter Mitchell Trubisky failing to top 170 yards in three of four games. Sunday brings a rematch against a Packers pass defense that flustered Trubisky and held Bellamy catchless in Week 1. Bellamy caught one pass for eight yards in Chicago's 30-27 overtime loss to the Giants on Sunday. Analysis: Bellamy continued to function as the clear No. 4 in the Bears' offense, and he's caught multiple passes on just two occasions this season. Unless his role expands, he's unlikely to be much help for fantasy managers. Bellamy caught two passes for 11 yards while adding a two-point conversion reception in the Bears' Week 11 victory over the Vikings. Analysis: With Kevin White inactive for the third straight game, Bellamy has settled in as Chicago's No. 4 wide receiver. However, with 76 receiving yards on the season, he doesn't provide fantasy owners with much upside. Bellamy wasn't targeted in Chicago's Week 10 victory over Detroit. 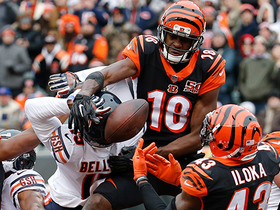 Analysis: After having been targeted 11 times over the past three weeks, the return of Allen Robinson to the lineup made Bellamy a nonfactor in the Bears offense. It's unlikely he'll emerge as a consistent fantasy option unless Chicago suffers injuries that allow him to see an elevated snap count. Bellamy was targeted twice but failed to record a reception in Chicago's 41-9 victory over Buffalo. 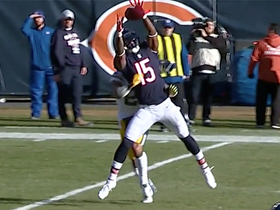 Analysis: With Allen Robinson (groin) sitting this one out, Bellamy saw multiple targets for the third week in a row, but he's failed to produce a reception in two of those contests. With just four receptions for 37 yards over his last 11 targets, he won't be a player whom can be counted upon for consistent fantasy production. 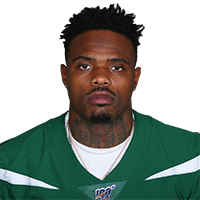 Bellamy is expected to have a regular role in three-receiver sets Sunday against the Bills with fellow wideouts Allen Robinson (groin) and Kevin White (coach's decision) both inactive, Jeff Dickerson of ESPN.com reports. Chicago Bears quarterback Mitchell Trubisky finds wide receiver Joshua Bellamy for an 18-yard gain. Chicago Bears quarterback Mitch Trubisky zips pass to wide receiver Josh Bellamy for two-point conversion. 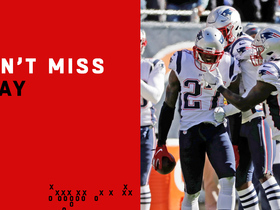 New England Patriots cornerback J.C. Jackson beats his man to the ball and dives for the interception. 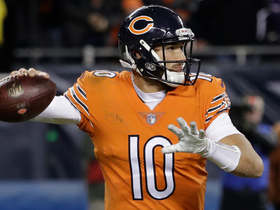 Chicago Bears quarterback Mitchell Trubisky passes for over 350 yards and six touchdowns, and runs for 53 yards in a 48-10 win over the Tampa Bay Buccaneers in Week 4 of NFL action. 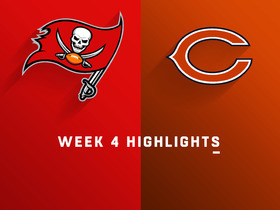 Chicago Bears quarterback Mitchell Trubisky throws for six TDs and running back Tarik Cohen has over 150 all-purpose yards in a 48-10 win over the Tampa Bay Buccaneers in Week 4 of NFL action. 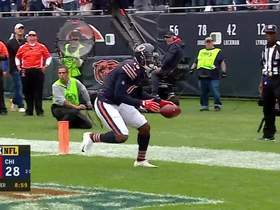 Chicago Bears quarterback Mitchell Trubisky drops a perfect ball to wide receiver Josh Bellamy for a 20-yard touchdown. 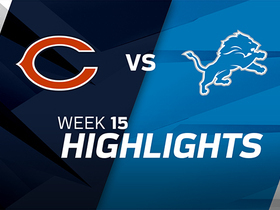 Watch the best plays as the Detriot Lions defeated the Chicago Bears in Week 15. 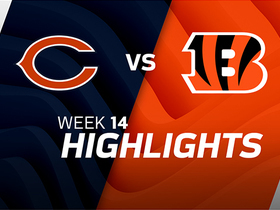 Check out highlights from the Week 14 matchup between the Chicago Bears vs. the Cincinnati Bengals. Cincinnati Bengals wide receiver A.J. Green breaks up Chicago Bears quarterback Mitchell Trubisky's hail mary attempt to end the first half.